The importance of the musician Bernardo Pasquini is well known to all those who dedicate themselves to the study of the harpsichord or organ. His vocal music, on the other hand, consisting primarily of cantatas, operas and oratorios, is far less known. But it includes true gems of vocal art from the late Roman Seicento. 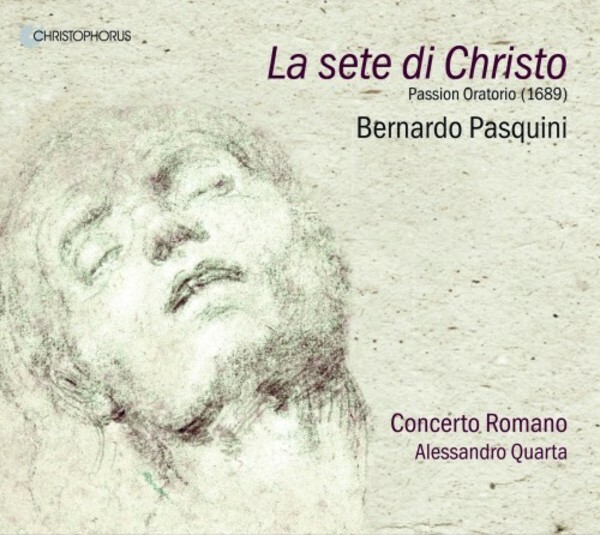 Pasquini belongs to the fortunate generation of composers who were under the patronage and sponsorship of such eminent personalities in Rome as Cardinal Pietro Ottoboni and Christina of Sweden, bringing forth the musical flowerings of the second half of the 17th century. In so doing, they made a decisive contribution to the stylistic and formal development of instrumental and dramatic vocal music in Italy up until the late Baroque period. La sete di Christo is a Passion oratorio. Four protagonists meet under the cross of Jesus on Calvary: his mother Mary, St John, Joseph of Arimathea and Nicodemus. The score’s sublime quality is nowhere in doubt and its absolutely original music-dramatic solutions were later assimilated by Handel in Rome. The pulsing rhythm of the musical narration goes far beyond the conventional erudition of the text, leading to a breathtakingly intensive finale.